As a kid, I did not like Thanksgiving. Not that I disliked it, I just didn’t see much in it for me. As far as I could tell, turkey could be served any Thursday, what was so special about this one? There was no decorating, no lead-up, no special task or activity unique to that day. No fireworks. No candy. No gifts. No costumes. I wasn’t invested in it, and thereby, I didn’t understand that a holiday based on little more than food and inclusiveness was actually pretty rad. The lack of hoopla, and all the other things I disliked about Thanksgiving as a child, are now the things that make me love Thanksgiving best of all holidays. With that in mind, I think it’s pretty darn cool when adults find ways to integrate children in the little formalities of the day. Simple stuff. Nothing that takes up a lot of time or money. Just easy ways to help kids feel included. Maybe that means letting the kids make a dish, or set the table, or maybe, that means letting the kids put something right on the table. The best part — these could not be easier to make! Have some drawings or art laying around? No more room on the fridge? Awesome. Cut them to the same height as those empty jars you have in your cupboard (don’t act like you don’t have empty jars). 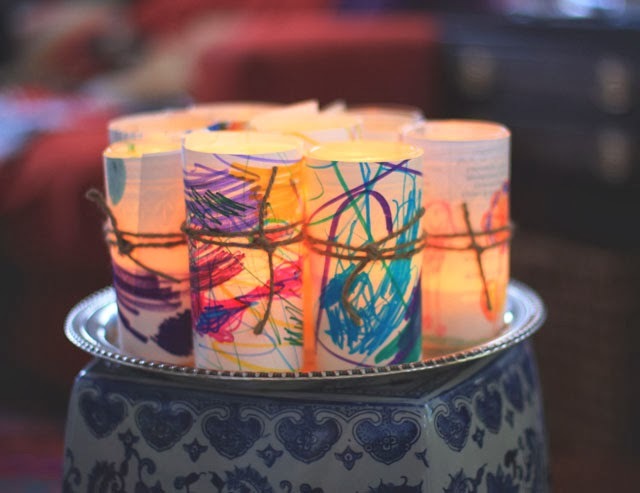 Then wrap with twine and drop in a candle. Boom! Worried about removing candle wax from the jar? Here is a tip. 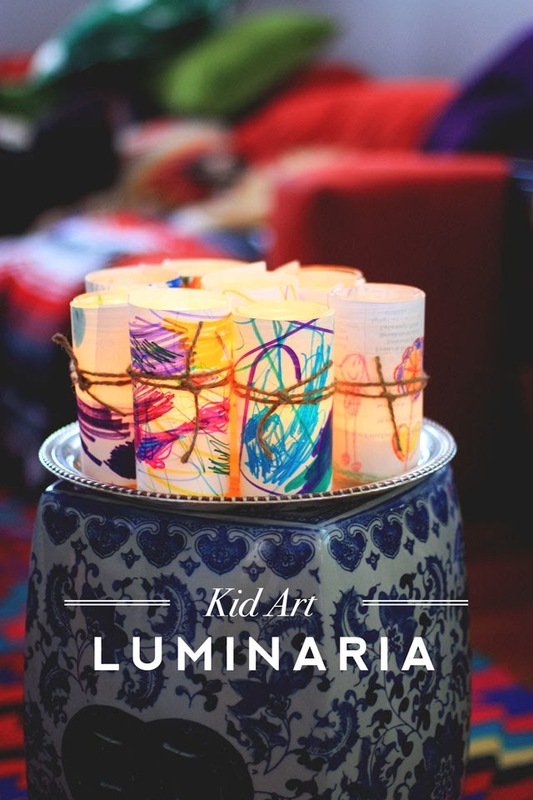 Looking for other ways to integrate kid art into your Thanksgiving celebration? 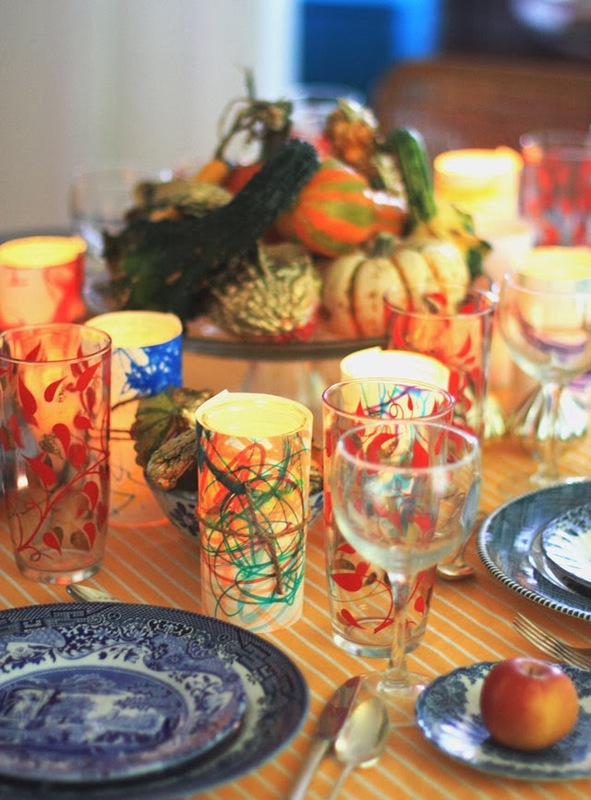 How about a festive turkey centerpiece? Or some feathers? I’m really in love with your blog. 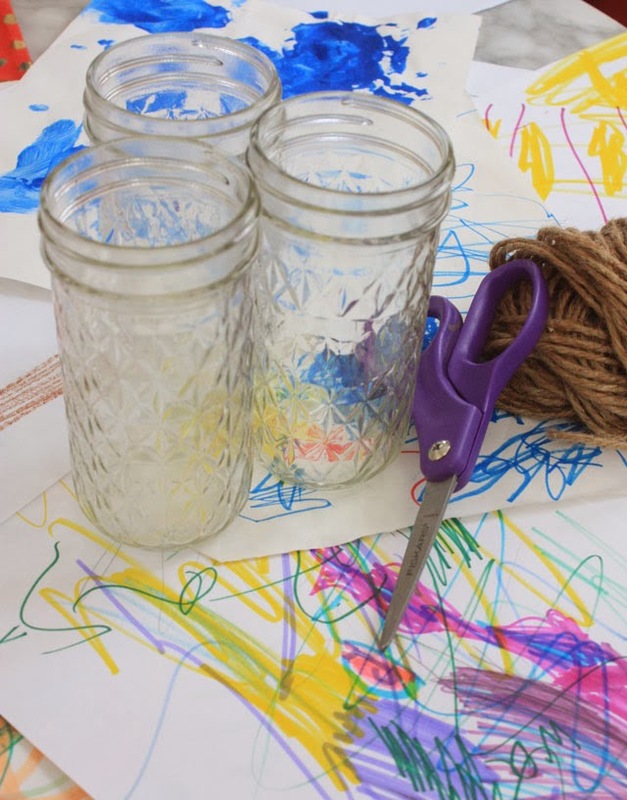 This craft is soooo easy & perfect way for kiddos to be involved with the decorations during times of celebration. Heck, I’m going to have some fun with this too! You never should have taken a picture of your dishes. I didn’t know that you had Blue Willow. How much more do you need? Polish that silver, okay? I have aBlue Willow collection too! I love your little plate under the apple- sweet!